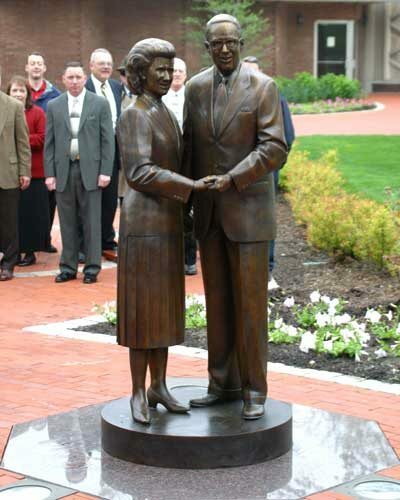 is there a 2nd Jack Hyles' statue? One wonders which translation they will use in the classroom. Is there an "authorized" TR Bible in Tagalog, the primary language of the Philippines? I was informed by no less of an authority than Dr. Gail Replinger to trust no Greek text but only the King James. will be English. That's from what I hear my Filipino friends tell me about how languages work in the Islands. Great. Fooling unsuspecting people in PI with a diploma mill. Sad indeed. After googling and then drilling through the HAC\Phil website, I assume it is an English language school. At least, all of the enrollment material is in English. Add to that what I wrote in my earlier post. They may be doing some good work there, we don't know. Pastor Randy DeMoville leads "The International Baptist Church of Dumaguete," and Hyles-Anderson Philippines seems to be a branch of this church. Dumaguete is a college town, according to Wikipedia, a port and a population center. The picture of four couples, assuming they are the faculty, shows them wearing the required suits and skirts, but that may be for FBH and Hyles-Anderson consumption. I've lived in the Spanish-speaking tropics and have met missionaries. Males normally wear a tropical shirt and slacks and many if not most women dress lightly but conservatively. Women in that culture do not wear shorts, period. This clothing is a concession to the 100 degree/90% humidity tropical weather. Of course, the website spoke glowingly of Pastor Jack Hyles. Why would you expect otherwise? It spoke of standards, separatism, and other normal IFB fare. My guess is the website is not directed at potential students but is a fund-raising tool. Having lived overseas three times in three different cultures, it is normal for missionaries and other professional Christians to adopt the clothing and many of the standards of the local culture. You may want to have "separation," but not too much, lest you stand out like the proverbial sore thumb. If not, you will end up with an American colonial compound that attracts only other Americans. Four "Anglo" couples and an American-style church stand out enough as it is in the Philippines. They must make some concessions if they wish to reach Filipinos. My hope it that somehow the true Gospel gets to the people they come in contact with. They will push the typical 1-2-3 pray after me/easy believism that Hyles loved so dearly and attempt to build a numerically "great" work there. If this is like most Hyles-type ministries, there will be more harm done than good when the complete story is told. FWIW, God can still work in spite of our messed up strategeries. Matthew, I hope your wrong but fear you're right. There is about 10,000 miles between Hammond, Indiana and Dumaguete, PI. Can FBCH and Hyles-Anderson control the action from that far away? Perhaps. They certainly can, and my experience with Hyles grads on the mission field is that the combination of Hyles control through the purse strings and cultish commitment by the grads turns into FBC transplanted all over the world. Funny thing is that my internet filter/blocker kept blocking their website--providence? With the current turmoil in HAdom, I think the power of the purse will be diminished. I can't speak to the commitment question. I hope that's true, but I fear it won't be. These guys pretty much only travel in their own circles, so, even though the support may not be coming directly from FBC, it is coming from other Hyles guys who hold their feet to the Hyles fire.